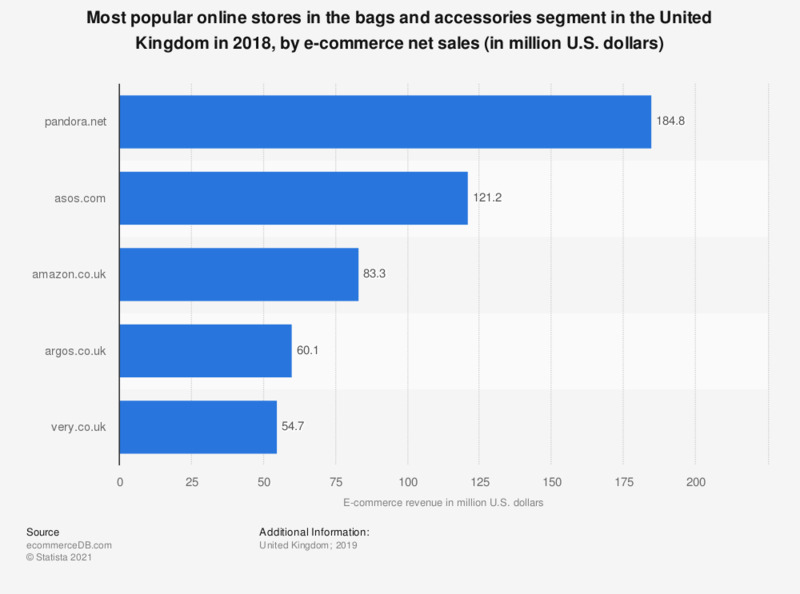 This statistic presents a ranking of the most popular online stores in the United Kingdom in the bags and accessories segment in 2018, sorted by annual net e-commerce sales. In 2018, market leader pandora.net generated 184,8 million U.S. dollars via the sale of bags and accessories in the United Kingdom. The online store asos.com was ranked second with a revenue of 112,8 million U.S. dollars. The e-commerce market category “Bags & Accessories” contains various types of bags and accessories. Included are e.g. leather bags, suitcases and purses as well as jewelry, hats, scarves, and gloves, amongst others.